Traditionally, croning, means crowning, ceremonies took place after elder women completed their tasks of rearing children and caring for her family and community. It was time to honor her caregiving through ceremony and care for her. These crowning ceremonies of age are important not only for women but for society as well. This ceremony honors the wisdom of the feminine and the society’s culture which is sustained by women. These crowning ceremonies of age are important not only for women, but for society as well. This ceremony honors the wisdom of the feminine and the society’s culture which is sustained by women. Today, these elder ceremonies are often held on a 60th birthday or upon retirement, and can occur for both men and women. 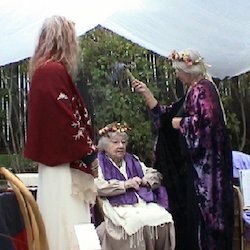 During the ceremony, the elder may recall all accomplishments of her/his life and be initiated into the wisdom phase of life. This honoring is ultimately important because the initiation hails in the time of sharing the wisdom that life’s experiences has given. One of the greatest self-rewarding adventures in life is to know that in her/his elder years, she/he still contributes to society, and that their shared wisdom is appreciated by family and community. The larger purpose of elder ceremonies is to help newer generations. As they formally recognize that their elders share gifts of wisdom and experience, they can start to prepare to be recognized and serve as they themselves age. With the age ceremony, the participants honor the gifts given over the years by the elder, and by this example, the community learns to give back to the next generation. The elder’s wisdom will carry on; even if her/his name is no longer spoken, the things that the elder stood for will carry on. That becomes a great sense of peace and satisfaction for our dear loved ones.